This winter certainly has been the season of snowflakes! Using the snowblower and the snow shovels has become a habit. Around dinnertime we are always famished! After opening the refrigerator door a welcome sight is finding one or two “leftover” foods from the previous two days. It is even better when they can be used together to prepare another easy, delicious, nutritious, filling dinner. Cheesy Veggie Chicken (click on the words for printable recipe card) is made with leftover baked/roasted chicken, frozen broccoli & cauliflower, Healthy Request Cream of Mushroom Soup, milk and taco cheese. Last night this easy dinner was prepared and placed in the microwave to cook and we certainly enjoyed it! The pieces of roasted chicken were located in our fridge. There was also a small amount of rice. Both of these “leftovers” were combined with other ingredients to make a scrumptious dinner. The addition of the rice was really nice! For directions click on these bolded words for the printable Recipe Card. A Warm Kitchen & a Delicious Dinner! Oh, it certainly is invigorating here in Western Massachusetts!!! Hats, gloves or mittens, boots and warm coats are worn every time we step outside of our homes. During this chilly weather I use my oven to prepare dinner whenever possible. A warm kitchen in the winter is the best! Tonight’s scrumptious dinner required a preheated 425°F oven. Only one pan was needed, because Baked “Tempting Tenderloin” and Zesty Carrots shared a large cookie pan. With the addition of microwaved “baked” potatoes and fat free sour cream, dinner was easy to prepare and tasted so good! Preparing dinner took little time. After getting the cookie pan ready, the Pork Tenderloin was rinsed in cold water and placed in the center of the pan. I placed two Bay Leaves under the Pork, drizzled the Olive Oil on top and topped it with about 1 tsp. of dried Rosemary leaves. The prepared Carrots were placed around the pork. Then, the meat (1 and 1/4 lbs.) and vegetables (1 lb.) were baked for 45 minutes in a 425°F oven. We never have any Zesty Carrots left after dinner. However, the two extra slices of Tempting Tenderloin will be cut into pieces at lunchtime tomorrow and placed in a Rosemary Flavored Wrap along with taco cheese for my husband to devour. Do you purchase Pork Tenderloin, as I do, when your grocery store has the Buy One Get One Special? There are many ways to prepare it and the recipe above is one method that results is a very tasty dinner! As we settle into our routines after enjoying a chilly, snowy, fun filled Christmas Holiday Season I always enjoy preparing an easy and nutritious dinner that does not require much fuss. Quite often that is my opportunity to use my West Bend Slow Cooker. This is a great way to start the new year! Vegetables and meat/chicken are very tender and full of flavor after simmering for a period of time in the Slow Cooker's Pot. Two evenings ago Chicken Florentine bubbled in the cooking pot of my Slow Cooker and emitted inviting aromas while this delicious dinner was cooking. The preparation was easy! Wash & Cut (2) Baking Potatoes with skins into 1” chunks. Place into Slow Cooker’s cooking pot that has been lightly sprayed with PAM. Defrost (1) 10 oz. pkg. frozen Spinach and spread on top of Potato chunks. Rinse and then place about 1 & ½ lbs. Chicken Tenderloins on top. Sprinkle about ¼ tsp. Oregano, ¼ tsp. Basil, ¼ tsp. Garlic Powder, 1 tsp. Parsley & 1 tsp. Chopped Onion on top. Mix 1/3 Cup Water with (1) Can Cream of Mushroom (Healthy Request) Soup. Spread evenly over top. Place lid on top of the cooking pot and set temperature. *** Sometimes we do have leftovers, which can be served again - on a bed of No Yolk Noodles or Penne. A Slow Cooker or Crock Pot makes a delicious dinner! 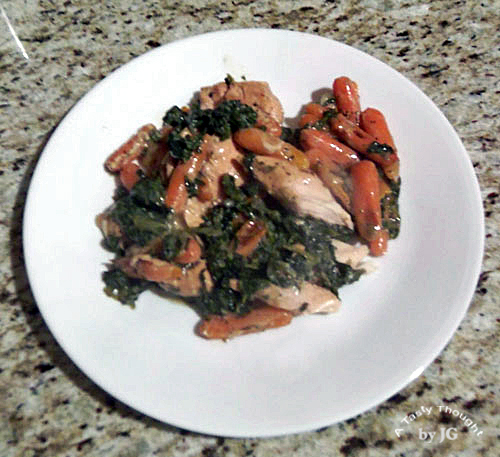 My family always enjoys Chicken Florentine a la Slow Cooker and now quite often I add Carrots when I prepare this easy tasty dinner. A 1 lb. bag of Baby Carrots (washed) is placed in the Slow Cooker's pot, first. Then, I add the Chicken Tenderloins and then the remaining ingredients. I do not place meat/poultry on the bottom (but on the second layer), because in the past I've scorched the meat/poultry in my cooker's pot if I do. Sometimes, I do not add the Potatoes.